Microsoft is holding an event on October 6 and expected launches include a slew of Windows 10 Lumia smartphones along with the long anticipated Surface Pro 4. 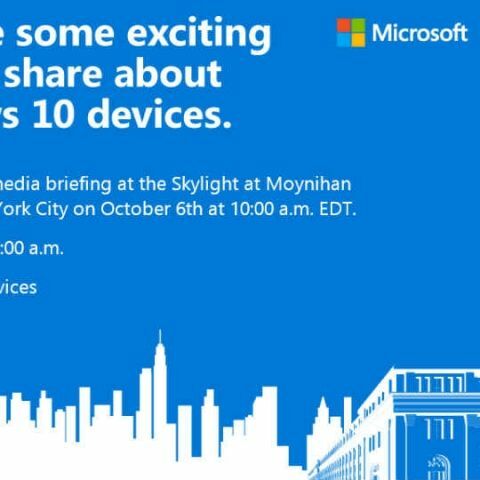 Microsoft has sent invites to the media for an event slated for October 6th in New York. Unfortunately, we haven’t been invited for the event, but that isn’t stopping us from speculating on what Microsoft will announce. If information circulating the Internet is to be believed, then Microsoft is all set to take on the iPad Pro with the launch of the Surface Pro 4. Expect a lot of “Pro” competition and memes scheduled for 2016. Other rumoured launches include the Lumia 950 and the Lumia 950 XL. Both the devices are expected to showcase the potential of Windows 10 on a smartphone. A Microsoft band is also rumoured to be at the event, but lets leave wearables for another day since the only Microsoft wearable we care about is the Microsoft HoloLens. It doesn’t come as a surprise that Microsoft is holding a Windows 10 event just a month after Apple announced the iPhone 6S, 6S Plus and the iPad Pro along with the new Apple TV. With the features of the iPad Pro comparable to the Surface Pro 3, it is expected that Microsoft will throw a few jabs at the Cupertino giant. Rumours also suggest that we will have a number of variants in the Surface Pro's lineup with the launch of the Surface Pro 4. What do you think? Does Microsoft need a number of Surface devices, or should it follow the, “if it ain’t broke don’t fix it” formula and stick with the things that made the Surface Pro 3 such a great device. Stay tuned, as we will bring you all the action from the Microsoft New York event. Lets hope the live webcast is better than what Microsoft showcased at IFA 2015. Expected date of launching windows 9 ?